In most cases, when a church needs a lawyer, it hires a lawyer. When it needs a plumber, it hires a plumber. But when it comes to making business decisions, most churches convene well–meaning but often inexperienced volunteers to form a committee, then they take a month and vote on the color to paint a door in the nursery. The church is not a business but it conducts business, and in many cases, the people conducting church business are not trained and/or experienced in business. This book was written to make pastors and ministry leaders lives easier and convey basic business wisdom, management principles, and best practices to right–brained, creative, relational people (i.e. pastors). 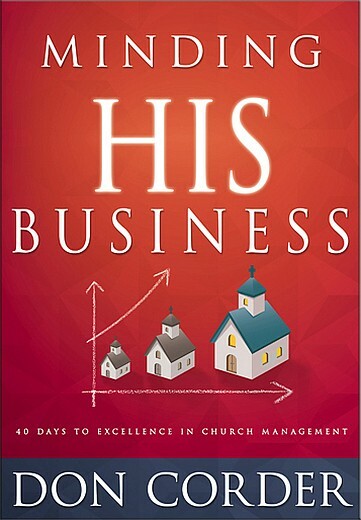 Unlike intimidating business textbooks, Minding His Business is written in forty short vignettes designed to be read like a daily devotional. Each chapter deals with everyday challenges and offers real–life examples derived from more than thirty years of experience that show how to (and sometimes how not to) handle each situation.